"The older I get, the more I feel this burden, this feeling of guilt, because I worked for a man, and I actually liked him, but he caused such terrible suffering....And the feeling that I was so unaware and so thoughtless I didn't notice or pay attention. That feeling has oppressed me more and more." Few people on the stage of modern history have sparked interest, for better or frequently worse, than Adolf Hitler. Indeed, sometimes it feels as if The History Channel should be renamed The Hitlery Channel, so nonstop does its WWII coverage become at times. But the number of those who can speak authoritatively about Hitler the man have dwindled down to just about zero in the nearly 60 years since his death. Astonishingly, however, one of those closest to Hitler during his last years dwelt for decades in relative obscurity, her story untold. 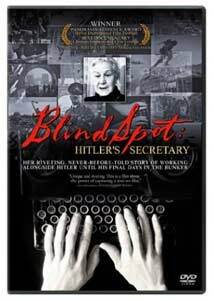 Blind Spot consists entirely of interview footage with Traudl Junge, who had been one of Hitler's secretaries from 1942-1945. The aged Junge (who died on the day of the film's 2002 premiere) relates anecdotes about those years, from the triumphant Nazi machine of 1942 through the utter ruin of the Thousand Year Reich three years later. Junge has plenty of fascinating anecdotes about Hitler's personal life and attitudes, which often contrasted sharply with his public persona. Of particular note are her memories of the July 20, 1944 bomb attempt on Hitler's life, but most interesting are her tales of madness in the final days in the bunker, when paranoia was rampant and suicide was the principal topic of discussion, interrupted only by an occasional glimmer of good news from the front. One curious omission is that she describes Hitler dictating his political last testament to her days before his suicide, but she doesn't really discuss what its contents were other than it seemed mostly a connection of old phrases. Junge portrays herself as having been entirely naïve about what was going on; she insists that she only typed public speeches and Hitler's personal correspondence and had no knowledge of the concentration camps and the Holocaust until years after the war. I'm not entirely convinced by the portrayal (she doesn't say who did handle the materials related to such matters), but Junge does engage in some self-reproach at her blindness to what was going on. In particular, she compares herself to a young woman active in the Resistance just her own age, and wonders how it was that she herself could not see things in that manner. Lest anyone think that the program is full of Hitlerian anti-semitic rantings, she does properly denounce Hitler as a criminal and a monster, but she also undeniably had affection for him, partly since he served as a missing father figure to her. What could have been very tedious visually (the entire program is just Junge talking) is broken up a bit by including shots of her viewing her footage from an earlier sitting. The audio continues straight through, giving it a continuity while also breaking up the blocks of talking head footage. Junge has a good attitude toward the procedure, laughing at how banal her testimony sounds, but she really just underlines the thesis of Hannah Arendt in Eichmann in Jerusalem that such evil is in fact just a matter of banality, a bureaucracy where papers get processed and millions die. Such monstrosities are not the work of non-human creatures, but ordinary people who like to play with dogs, like pretty girls, and enjoy a good meal. There's not a great deal of content here that one wouldn't find in a standard biography of Hitler, though there were some tidbits, such as an ultimatum from Göring to Hitler about becoming his successor that I'd not heard before. But even so, it's an entirely different experience hearing the stories directly from a woman who lived through them herself. The film's producers deserve thanks for preserving this testimony before her voice was silenced. Although over 80 years of age, Junge's mind was still sharp and her recollections quite clear. It's odd that no one before this thought to ask her about them. Image Transfer Review: The full-frame picture appears to be shot on video. There's a slight lack of sharpness associated with that medium but color and black levels are quite good. Textures are not terribly evident most of the time. I didn't detect any pixelation, and there's surprisingly little edge enhancement for a disc from the Sony/Columbia works. It's about as good as the source material would permit. Audio Transfer Review: The audio is a 2.0 mono that sounds fine for the most part. There's mild background noise but nothing substantial. Junge's speech is quite clear throughout, and readily understandable even with my less-than-elementary German skills. There is no music. Extras Review: The disc doesn't sport much for extras. There's a surprisingly nonanamorphic widescreen trailer for the feature, plus a full-frame one for a documentary on Shackleton's disastrous Antarctic adventure on the Endurance. There are also unskippable FBI warnings for your viewing pleasure before the feature. The chaptering is quite good for the first half hour, but becomes rather thin during the last hour, with an odd selection of chapter stops. Footage of people who were personally close to Hitler is scarce indeed, and this set of interviews helps to put a human connection to the infamous chancellor of Germany. A must have for any history buff.